Surrender to the enchantment of the Stressless Magic recliner as you nestle into its plush contours. With supple padding, this recliner is a masterpiece in the furniture industry. The Plus™ system adjusts as you move to give optimal neck and lumbar support. The recliner’s Glide system attunes itself to your every move providing optimal support whether you are sleeping, reading or visiting with friends. The 360 swivel and adjustable ottoman complete the perfection of this lavish piece. 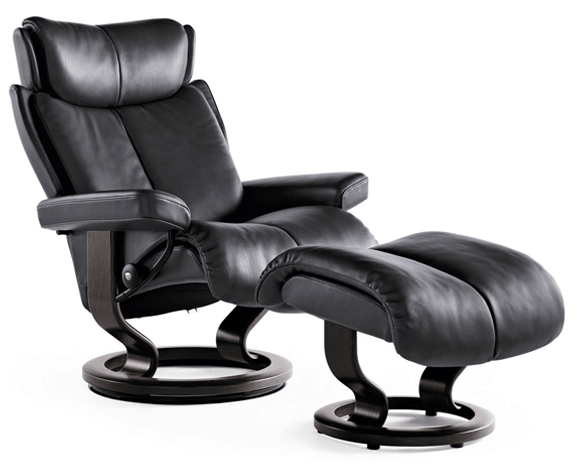 The Stressless Magic will charm your guests with its comfort, elegance, and form. Bring the enchantment of this exquisite recliner to your home and enjoy luxury from a name you can trust. The Stressless Magic (M) recliner is designed to fit people of average weight, height and stature. Far from being a one size fits all, the Plus™ system adapts as you move to support to the lumbar region of the back. The Stressless Glide system assures good circulation by properly balancing your weight at all times. An adjustable head rest and full 360 swivel mean that you can release all tension while still being able to move as necessary. The ottoman tilts and adjusts to become just the right height and angle for you to achieve optimal comfort. This medium-sized meticulously crafted recliner is the crème de la crème of elegance and luxury. You’ll immediately relax when you sink into this plush recliner and conjure images of European splendor. Revel in its charm as the Plus™ and Glide Systems conform to your body’s needs. Eckornes offers a 10-year warranty on the internal mechanism. A 5-year warranty covers the chair and ottoman’s wooden laminate, including the swivel ring, all foam, and interior padding. It does not cover normal wear and tear, damage caused by misuse, or damage caused by unauthorized technicians. A 1-year warranty covers the leather upholster. 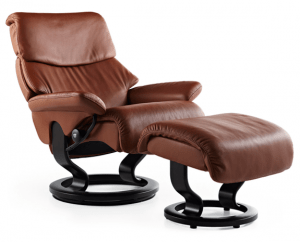 This is assuming the product has been cared for and maintained using recommended Ekornes guidelines for leather furniture. Returns must be discussed within 48 hours of delivery.